About 380 Different Manuals for Gray-Market Tractors. All manual sales are final - no returns will be accepted. Parts Manuals break the tractor apart piece by piece. These manuals are great for ordering parts. Most parts manuals are $49.95 plus s&h. Operators Manuals instruct on general use of the tractor. Many of these cover several similar models. Operators manuals are $36.95 plus s&h. 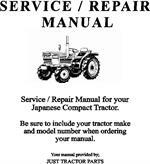 Service Manuals are useful when rebuilding, servicing, or doing general maintenance on your tractor. Service manuals are $36.95 - $49.95 plus s&h. Please check the lists on the corresponding links to see if we carry what you need. Please notice some manuals are only in Japanese. These are indicted wiht (J) next to the model number. The manuals which we sell are reproductions made from original books. Most of these manuals are no longer available from the different tractor manufacturers. Lists are updated whenever inventory changes. All book sales are final; no returns will be accepted. All prices are subject to change without notice. 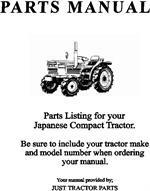 Parts manuals are available for variety of Hinomoto tractors. Check here for available manuals. Iseki / Bolens Parts, Operators and Service/Repair Manuals available. Check for available models. Kubota Parts, Operators and Service/Repair Manuals available. Check for available models. Mitsubishi & Satoh Parts, Operators & Service/Repair Manuals available. Check here for models. Shibaura Parts Manuals Available. Check here for available models. Yanmar Parts, Operators and Service/Repair Manuals. Check for available manuals. The Operator's Manual will help you operate your tractor and gives you some maintenance schedules to keep your tractor running good.